Company Overview - Zhejiang Kaixun Mechanical & Electrical Co., Ltd.
17YRSZhejiang Kaixun Mechanical & Electrical Co., Ltd.
Kaixun Group--zhejiang kaixun mechanical and electrical co.,ltd founded in 1998 , an export-oriented high-tech enterprises which integrates R&D, production and sales into one body, specializing in manufacturing various 380 items, including hoisting machinery, financial equipments, electric winch, electric truck, electric forklift and hydraulic Car, etc.Our company locates at Linyang lnd. Zone, Rui'an city of glorious south wenzhou. covers an area of 59000m2, structure area 87000m2 With self-possessed capital RMB 350 million and production equipment 880 sets(among them, testing instruments 260 sets), We have the ability to output of RMB1500 million every year.We won many honors. 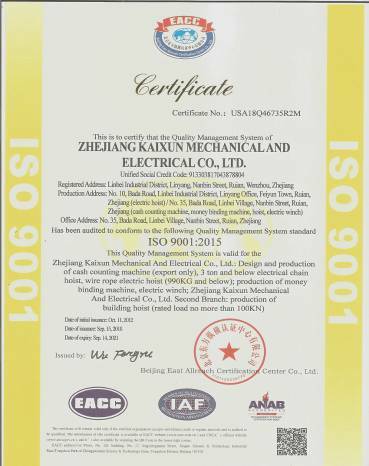 "Kai-xun brand"products are granted with "Zhejiang famous brand products"and Zhejiang well-known trademark". 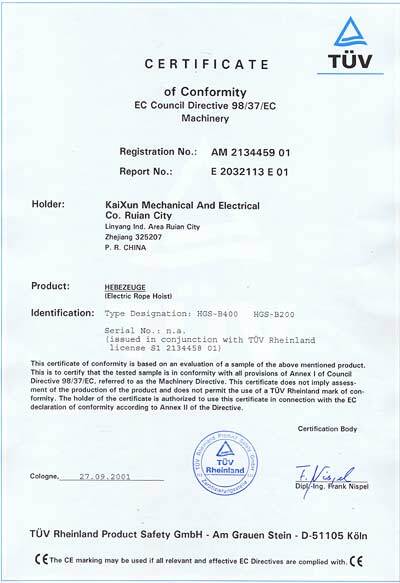 "Kai-Xun" Enterprise is appraised as "Zhejiang Province middle and small scale technology enterprise ", "high-tech enterprise in China ", "Zhejiang province AAA trustworthy enterprise"and "Wenzhou city light industry top 100 enterprises ".We aim to"set up Kaixun brand, create top quality, offer best service and ensure customers satisfactory", strengthen quality management and we have passed the certificate of ISO9001:2008 quality system. 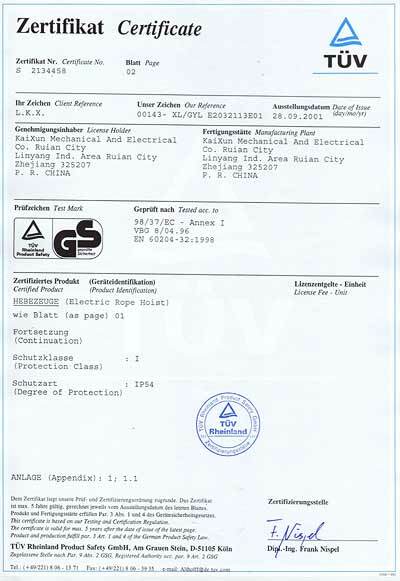 Many products have got CE, GS, ROHS, CB, UL, CUL, and FCC approvals. 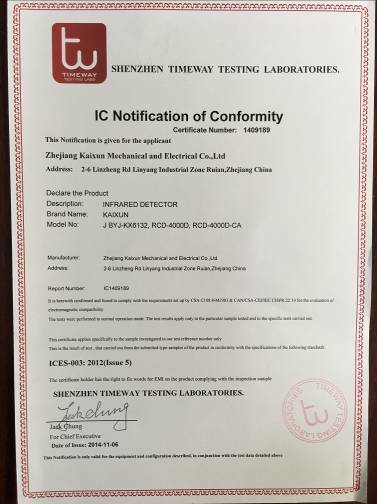 Most products passed evaluation of province-class and got the national special equipment production license and industrial products production license.With advanced products, good quality, full range products and perfect after service, we got a better credit and the performance of export is notable. And now 90% we have been exporting in bulk to EU, America, Africa, Middle east, Southeast Asia and Russia, lndia, Pakistan and Hong Kong etc. Over120 countries and regions. 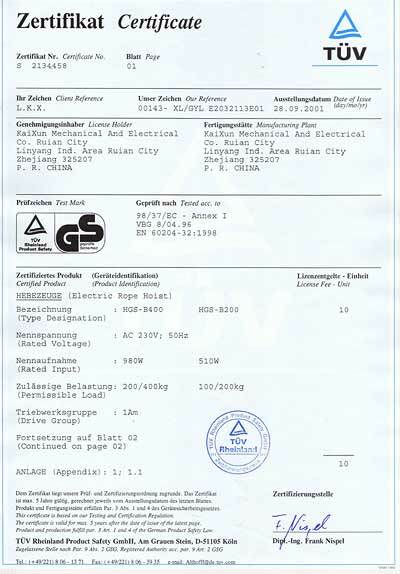 Our products are highly praised by foreign clients. 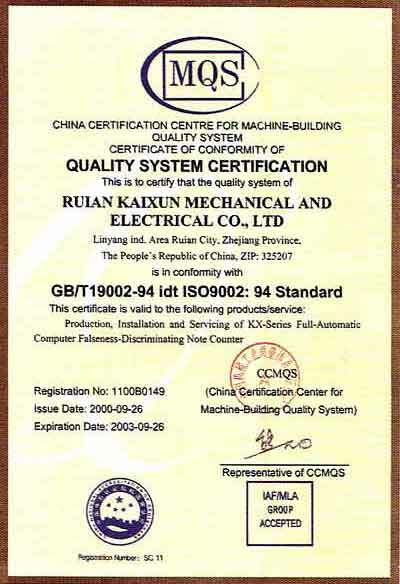 Issued by the China Certification Center for Machine-Building Quality System.